The supplier does not allow discounts on this item, but receive $3.00 in reward cash to use on any future purchase. worth $3.00 in future purchase credits. Works on Android phones and tablets but works BEST with Amazon Fire tablet. App is available on Android Play Store and Amazon App Store. 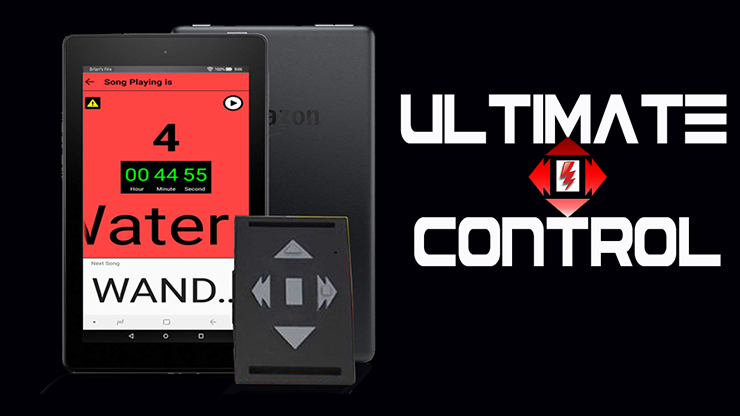 The original Ultimate Control had an mp3 player, but the new one works with any Android device. DON'T WORRY MAC USERS... it is easier to learn than the mp3 player was! PLUS- if you break the Android device, you can get one practically anywhere and be up and running again in no time! The patented Ultimate Remote built-in magnetic switch so you can fade, cross fade, or play your music by bringing a magnet close to the remote. You could wear a magnetic ring, or strap a remote to one of your ankles and a small magnet to the other! FM radio frequency burst signal - The best technology available. Strong and secure. Rechargeable. Plug it in for 30 minutes once every few months. Yes, you read that correctly. Each button has a short press and long press function. Receiver device with antenna and cord (plugs into Android device). (Optional) Toe Switch: plugs into the remote. Put it in your shoe, strap it to your thigh, on the stage, in your table, behind your tie... Many options. Standard version has round plastic housing. Mini version is just a small button on a wire. In 2007 I had an idea. I wanted to create the BEST and most innovative music control system available. After all, when you are on stage you need your music to cue at the right time with the right song! Sound booths notoriously mess that up... and that's when you have a sound booth! It would have to be easy and reliable. Thousands of hours and $125,000 later it was a reality. Back then it took getting a big loan and selling my pride and joy antique Ferrari to make it happen. In 2012 we released Ultimate Control to the world. It took the entertainment industry by storm! We offered features never before available. As we were planning another production of them in 2014, disaster struck. An essential component was no longer being produced. One 8cm square of silicone would bring my dream to a halt. We were faced with a dilemma. We could invest over $100,000 AGAIN to redevelop the very popular Ultimate Control, or we could start over... and make it better. In the middle of thinking about what to do, a very animated magician and electronics expert, Yaniv Levy from Cobra Magic in Israel, approached me about how we could make Ultimate Control into an app. When he mentioned it, I had no interest at all. Yaniv, however, had a plan in mind and wasn't taking "no" for an answer. The work began. It wasn't until I had the first remote and first version of the app in hand that I realized the genius of his idea. We didn't need to create an mp3 player when so many companies already have excellent devices available. We were trying to reinvent the wheel! All we needed to do is tell the existing device what we want from it. Now we can focus more on the remote and features. So, how is it better? Buckle your seat belts! You are in for a wild ride. Charge from any computer or outlet anywhere in the world! Oh, and you will need to do that every couple of YEARS. A note to my Apple fanatic friends: I know, I know... it's not on iPad or iPhone. We may do this in the future and if we do, you will have a cost-free transition (assuming you have your own Apple product to put it on). For now, all you need to learn is this one simple app. You are actually better off than others because you won't be tempted to use the tablet for anything else! Track # playing, name of current and next songs displayed large on the screen. Setting so the screen will not time out. Simple interface with windows and Mac. Easily move your songs from iTunes. Easily make many different playlists. Set device so that songs either play continuously or cue up and pause waiting for a command. Make playlists right in the device. Edit playlists right in the device.Set individual track volumes to regulate the natural differences from downloading from different locations and for dramatic effect in your presentation (e.g., a sentimental piece can have a low volume track playing in the background without having to touch controls). The remote is also factory made. The design was created by a think tank of 8 entertainers with every last entertainer's needs in mind. Fade out button on the side allows music to fade out in a quick squeeze of the remote. Custom designed by entertainers for entertainers. Curved back so it fits around your leg and won't flip around in your pocket. Feel the buttons click when pressed so you know you pressed the button. Raised spots on next track and volume up buttons so you know which button you are pushing. Shaped button so you know which button you are pushing.